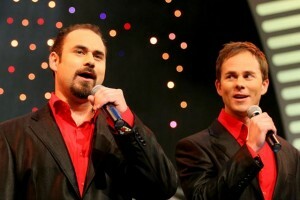 Louis & Willem Are Awesome! » "When the crowd gets that hysterical, there's a reason…"
Just a quick heads-up, the brothers are now performing all over South Africa under the name of “Silwer”, and their official website can be found at www.silwermusic.com . 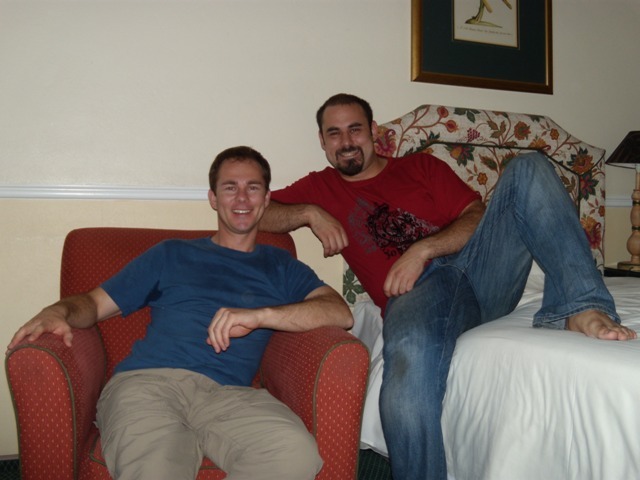 There are a couple of audio clips that you might want to listen to on the site as well. Give it a quick visit, and enjoy! They also have a facebook fan-page now. 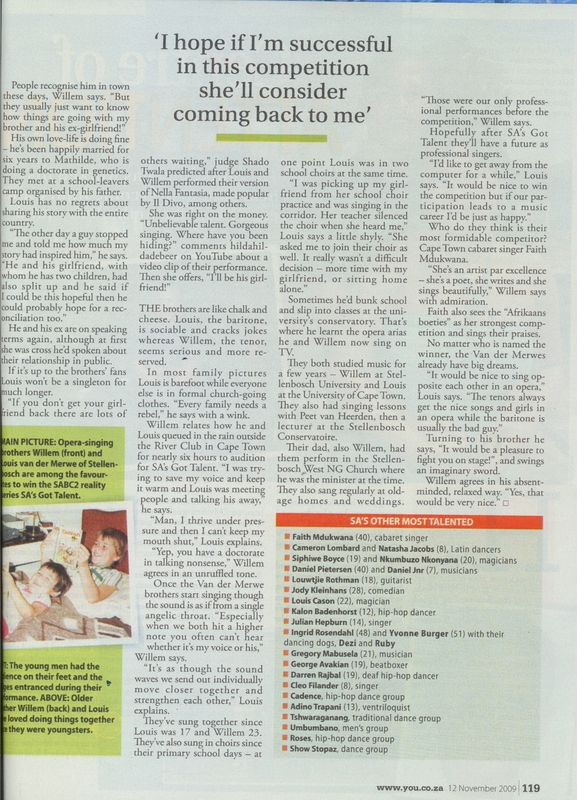 Willem & Louis sent through this message to share with everyone today. Suffice it to say, watch this space and subscribe to the mailing list so you can hear news about upcoming performances and (fingers crossed!) CDs etc! Thank you, everyone. We can never thank you enough. You made this possible for us with your support, and we appreciate it immensely. You were the ones that voted us in, that put our four feet on the path that led to us starting to fulfill our dream of being the singers we have always wanted to be. In particular we would like to thank some other people (and in no particular order 😛 )… My family for being the the truly loving family that they are, our friends for supporting us, our voice teacher Petrus van Heerder for teaching us to sing all those years ago, Rapidblue for giving us this opportunity, Onicka for introducing us to the world of the media and helping us with how that works, Pam for being awesome not only with amazing organisation skills- but also for not biting my head off (Louis) for requesting two more audience tickets for two good friends of mine… um… two hours before our semi-final- Lynn for making us feel smarter than we have ever felt before, enabling us to walk onto that stage and just feel like we own it, and also for climbing into our hearts… Brandylee and Murray for always being the center of calm and helping with our strange requests (“Murray, we need a room to be left alone in to warm up our voices. Also, Lunchbars for afterwards, please!” Murray : “I can do that, wait here.”), the other contestants for creating such a wonderful feeling of camaraderie and friendship, Christa for helping, Nomusa for being that friend, our friends Albert and Marion for all that they did and lastly… and with this I will single her out… Meri. From the word get-go, you have been giving it your all to help us, help me. From the moment you heard that I sing ten years ago, you have supported me in it and later on my brother too, being that voice of reason going “I know you guys do IT, but when will you sing?”. Thank you. Thank you for being the best friend anyone could ever hope for. Seeing that I am writing this, I will put in a last part. Thank you, you, for motivating me to enter… and thank you, my brother Willem, for being the best brother one could ever hope for. I have been proud, and honoured, every moment that I have shared this journey with you. Our lives will never be the same again, and I look forward to sharing every moment of this very exciting next part of it with you. And to end, all I can say is “Watch this space!” There are big plans for the future, we are going to make a CD sometime soon, and we will be performing every chance we get. We look forward to meeting you! For anyone who missed it (like the poor folks overseas — has SABC2 never heard of video streaming?!) here is the brilliant performance of Time To Say Goodbye from Willem & Louis on the final of South Africa’s Got Talent. Let’s just start off by thanking you all for your continued support! Tonight (19:30 on SABC2) is the SA’s Got Talent Final, where Louis and Willem will be up against some very tough competition. We need you to once again pick up your phones and vote like mad! They’ve come a long way since their first edition. We’re all very proud of them. Let’s see if we can give them one last push! As promised, here are the videos of Louis and Willem’s semi-final performance, as well as the announcement that they’re through to the final! Thank you very much to everyone that voted for Louis and Willem. Thanks to your support, they are one of six acts that are through to the semi-finals! We’ll get hold of a few pictures and a video of their performance as soon as possible, so you can relive the awesomeness. Make sure to tune in again tomorrow night for the finals. Once again, a BIG thank you for all your support! “On the eve of the night before our big semi-final day, we would just like to thank everyone for their wonderful and overwhelming support so far – family, friends and people who used to be strangers to us, alike. It has been quite a journey, a quest in more than one way (you know what I mean…-Louis), and the culmination of the chance at a dream that we as brothers have shared for our whole adult lives. We will probably be too busy to say thank you tomorrow, so for now, just once again thank you, and thank you for everyone that is going to vote for us. Words can not describe our appreciation. We look forward to singing for everyone that helped us get this far, believed in us during the tough times, supported us… and everyone that will be watching tomorrow. 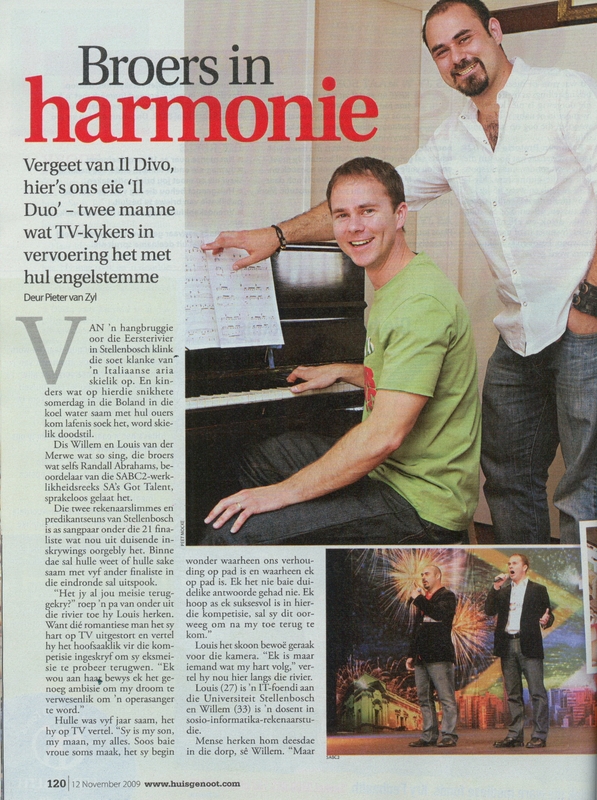 Louis & Willem featured in You and Huisgenoot! 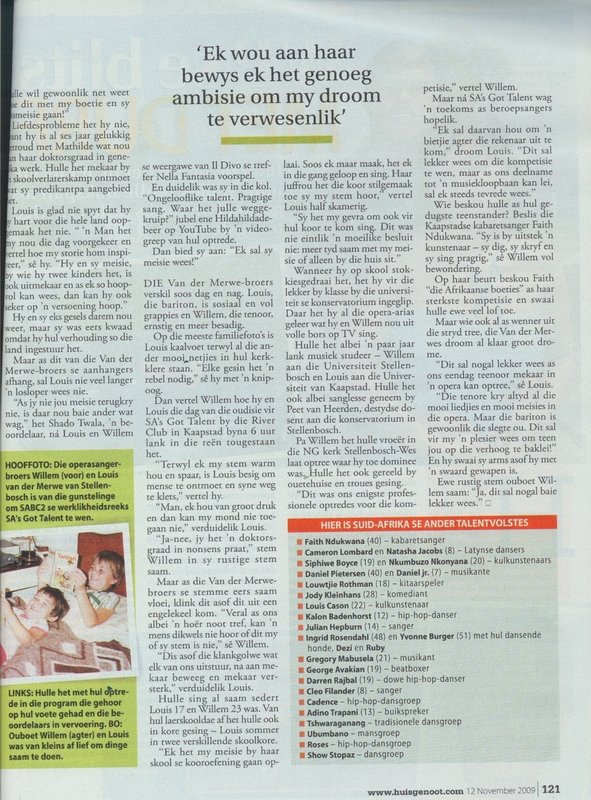 Louis and Willem are the star feature in this week’s YOU and Huisgenoot magazines. Thank you so much to Albert for scanning these in and sending them over so that we could share them. 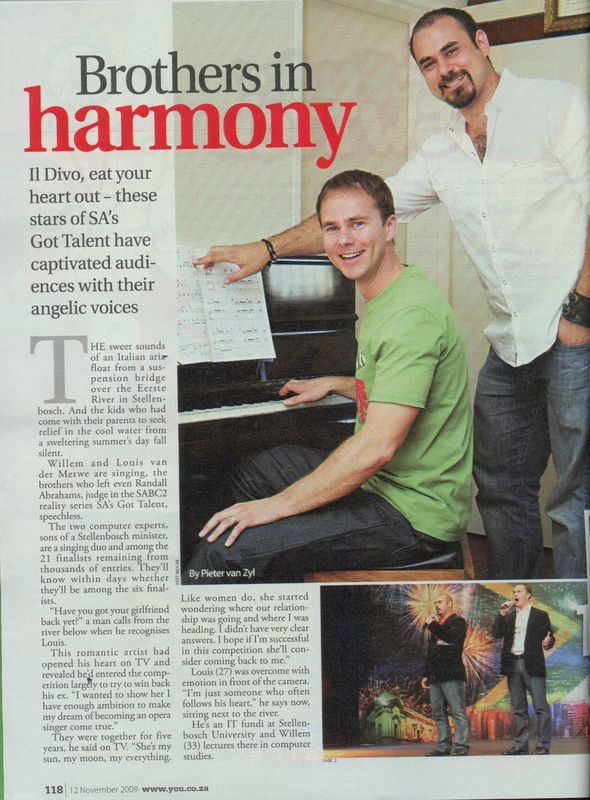 Article in You magazine entitled "Brothers in Harmony"
Tonight’s Sizzling Six includes Louis & Willem as one of their top picks!